eScan, one of the leading Total security solution developers, turned 25 this year. To commemorate this milestone event, eScan hosted 'Mega Event' for its PAN India partners in association with KK software Pvt Ltd. They also introduced eScan Anti-Virus Total Protection with 10 Users for the SOHO section. The event was held at Raddison Blu Hotel, New Delhi which witnessed around 100 partners from all over India. 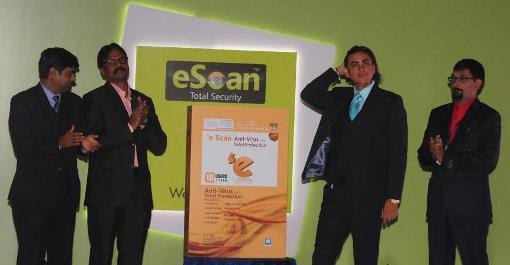 During the event, eScan showcased and educated the partners about its latest products and new solutions for IT security. They also announced beneficial channel schemes that will benefit eScan's privileged channel partners with good value proposition and profits. Further, channel partners were given awards and recognition to motivate and keep the partners committed to build, develop and sustain long-term and healthy relationships with us. eScan launched a special offer for the partners in association with KK Software Pvt. Ltd. The offer includes various trips to Switzerland, Pattaya and Goa to be claimed by the partners on purchase of certain number of eScan Anti-Virus with Total Protection and eScan Internet Security Suite box products. eScan values its relationship with the channel partners and with this scheme, rewards their commitment for their contribution to make the company reach the end users. "On behalf of the entire eScan team, we would like to sincerely thank everyone who helped us reach this milestone. The last 25 years have been filled with challenges, hard work, dedication, innovation and lot of success. All these years as industry leaders, we have always pushed our limits by reinventing and consistently delivering the best of class security solutions. We promise to continue this momentum to stay ahead in the game so that our partners as well as our customers can get the best that the industry has to offer," said Mr Sunil Kripalani, Senior Vice President, Global Sales and Marketing, eScan. RK Balu, General Manager, eScan, "eScan today boasts of worldwide reach for its solid R&D and customization abilities. Our channel partners play a very significant role in the many milestones we have achieved in the last 25 years. We believe that with the new IT security solutions that have we launched, it will help us immensely to get into a much bigger growth in the coming years." eScan Anti-Virus Total Protection, designed for home and small office users, is a comprehensive Anti-Virus and Content Security Solution that provides complete protection to your computers against malicious content and security threats, such as Ransomware, Spyware, Adware, Keyloggers, Rootkits, Botnets, Phishing and more. eScan's range of security solutions are certified by Global testing bodies like AV Test, AV Comparatives' Real World Test & Real Protection Test and VB 100 Test and many others.